iPad 3 SIM card holder assembly with flex cable this is a replacement internal part for the iPad 3. 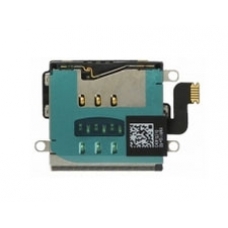 This replacement part includes the SIM contact reader which allows the iPad 3 to access the SIM card. If the part is damaged for any reason, your iPad 3 will no longer use the inserted SIM card. Replace your broken, damaged or cracked iPad 3 SIM card reader assembly with a genuine original replacement part. * Apple Part Number: 821-1265-A.